I always feel a little wary about "anticipated follow-up" movies. They exist solely in an environment of increased expectations, bigger budgets, larger scope, and bigger names, and only sometimes do they surpass the initial film. The thinking is always "Hey! That worked out much better than expected and I can't even remember right now if there were any possible problems before that huge, surprise success. Let's do it again!" In a sense, follow-up films are essentially the middle children of the reel world. And like all middle children, sometimes it works out even better than you thought it would; and sometimes you just end up with a whiner. I should state right now, I actually don't know anything about middle children, I'm an only child. I'm just judging about the phenomenon from internet memes and other people's observations, but I felt the analogy might work. Neill Blomkamp's Elysium, falls somewhere in the middle of the middle child syndrome. I feel it behooves me to compare it to another pop culture reference. If films are the Cosby kids, Elysium is definitely the Denise of this summer's releases. It's not as sure-footed or narratively-focused as its predecessor (in this case, District 9 is the always reliable Sondra) but it is quirky and interesting, and although not necessarily surprising, it does own its boldness. Just like that time Denise returned with a surprise husband AND step child. District 9 was a hit because it slapped people in the face a bit. With its guerilla-style camera work and its pseudo-documentary story, not to mention a bold allegory about equal rights, it was one of those sci-fi movie moments in cinema history. It was what Hollywood loves to attempt to make happen: an indie movie that everyone can eventually latch on to. That kind of surprise can never be replicated. 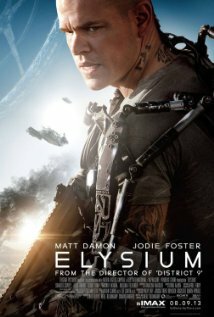 Still, the same expectations were placed on Elysium, and for a while, it seemed like the magic was in place to pull it off again. There was, of course, buzz about the project once the cast was let out of the bag, Matt Damon and Jodie Foster are KIND of a big deal, but the storyline was kept vague and the few set photos that did leak were out of context and, therefore, a bit confusing. However, these sneak peeks led to a general level of intrigue, which is always a guarantee for getting me in to a theatre. There’s just a general level of vague-ness around the plot and an over-reliance on movie villain stereotypes, which made it feel outdated, and not in the good, retro kind of way. Jodie Foster has an unnecessarily affected accent that kept me distracted throughout her scenes, while Sharlto Copley’s Kruger is a blood-lusting Neanderthal, who looks like he might have just recently escaped the Thunderdome. I had higher hopes for both of them. Along those lines, the chemistry necessary for a believable subplot of Damon's Max and his love interest Frey (Alice Braga) never fully materialized, and so his sacrifice at the end, which is accompanied by a slow motion flashback, lacked the emotional manipulation I usually fall so easily for. In addition, the released film feels a bit like the fast-forward version of the film that Blomkamp initially set out to make. There are glimpses of greatness beneath the surface, but the editing of the film leaves it feeling heavy-handed and preachy as opposed to freshly analogous. The example I keep coming back to is (SPOILER ALERT) when Jodie Foster’s Delacourt, dies. She is shot, and granted, she wasn’t near a MedPod, but she doesn't even try to fight or save herself. She has spent the enitre film being as terrible and conniving of a person as you could possibly conceive of, going to any means necessary to usurp the Presidential powers of Elysium, to keep these heathens off of her planet, and then, she is shot and basically says “I’m done for, don’t try to save me”. Did she get religion in those last 20 seconds? Did I miss something? Her whole death scene is a complete 180 from her character. The archetypes are just too archetypal, and the complexities of character are never explored. I feel like there’s a much better film lying somewhere on the digital cutting room floor than ended up on the screen. It just feels like a stunted film. It could also just be that I don't like to see Sharlto Copley mindlessly evil. As with District 9, Blomkamp’s world is a fully realized, visceral experience. On Earth, it’s grimy and gritty, filled with favela neighborhoods which are populated by corrugated metal shacks and broken down vehicles. It’s a perfectly plausible interpretation for the evolution of humanity. The tech on display is amazingly detailed, and I think a good chunk of the budget was spent on spacecraft and MedPods and weaponry, all of which help the movie LOOK amazing. There are great little beats, like where Delacourt, looks at her futuristic watch and it’s a Cartier, or where other name brand logos are placed on all the Elysium worthy technology. It seems that world-building was the priority here, which makes it a great spectacle, but the story doesn't quite measure up to the spectacle's standards. It's clear that there's a lot of effort and intelligence going in to the making of this movie, I just wish a little more time had been given to character development. I also can understand now why Blomkamp initially offered Damon's role to Eminem and Die Antwoord's Ninja, and I would have liked to see that version of the film.